Following in its own tradition of creating watches inspired by the ancient Chinese astrological signs, Officine Panerai unveils its newest in the series: a special edition of the Luminor 1950 Sealand 3 Days Automatic Acciaio – 44mm. The watch is a tribute to the Year of the Rooster, which begins later this month. 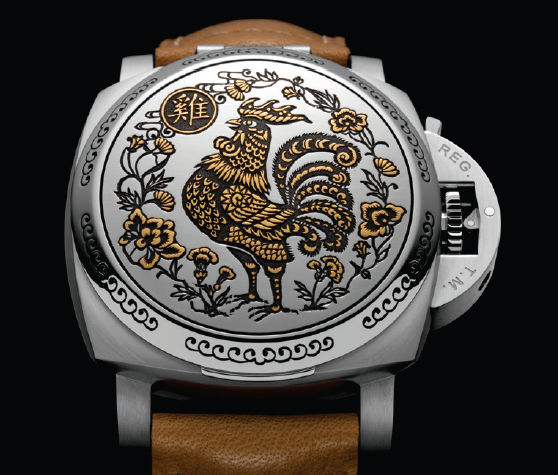 The watch is different from the other year of the rooster watches that we have shown thus far and that we will be presenting this month in that the depiction of the rooster is not on the dial. 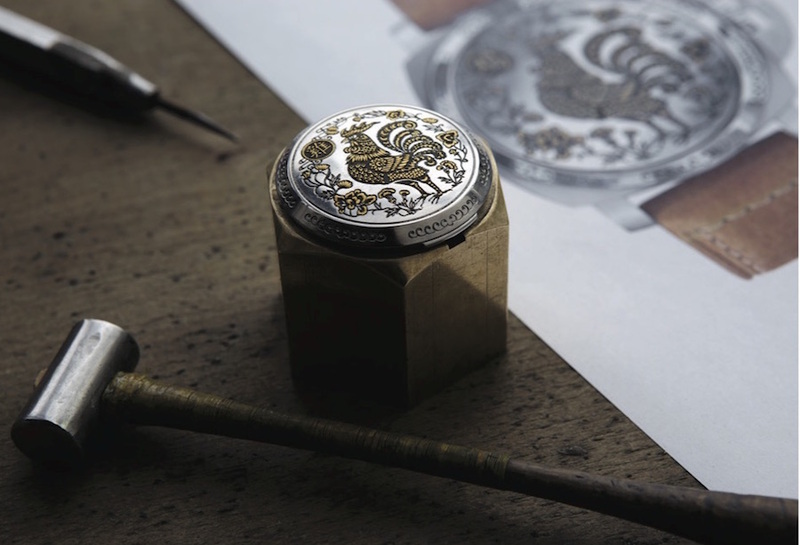 This watch features the elegantly engraved Rooster on the watch cover. 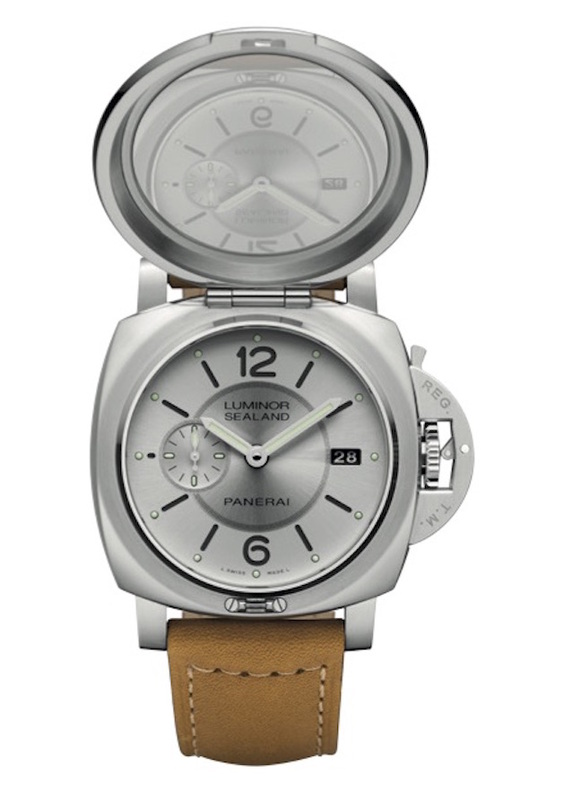 The watch cover opens to reveal a gray dial with date indication and mirrored inner cover. The techniques used are oriental iconography methods that include “sparsello” — an ancient art whose name is derived from the tool used to make the decorations. The grooves in the steel cover are decorated with inlaid gold to create the outline of the rooster. The engraved cover opens to reveal a gray dial with Arabic numerals, date and sub-seconds dial. The watch is powered by a p.9000 automatic caliber, executed entirely by Panerai, and offering three days of power reserve. It features a bi-directional oscillating weight. The watch is water resistant to 10 bar (100 meters) and is finished with a soft brown leather strap and sold with an additional interchangeable black rubber strap. Just 99 pieces will be made. It retails for $21,300. The rooster, one of the most energetic and determined signs of the Chinese Zodiac, symbolizes courage, perseverance, determination and consistency. Roosters are proud of their feathers, their overall appearance and their ability to create an unparalleled wake-up call at dawn. The Officine Panerai Luminor 1950 Sealand 3 Days Automatic Acciaio 44mm Year of the Rooster watch is made using ancient engraving techniques.